In this tutorial, we will introduce the root locus, show how to create it using MATLAB, and demonstrate how to design feedback controllers that satisfy certain performance criteria through the use of the root locus. 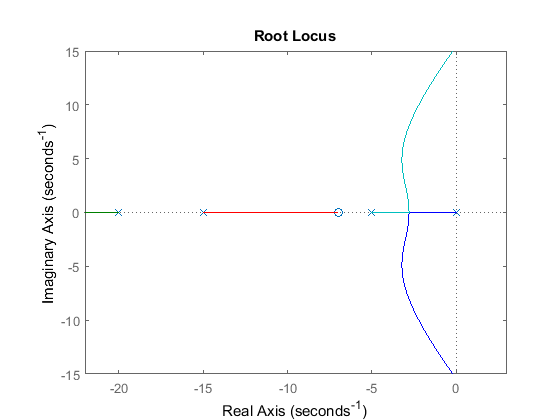 The root locus of an (open-loop) transfer function is a plot of the locations (locus) of all possible closed-loop poles with some parameter, often a proportional gain , varied between 0 and . The figure below shows a unity-feedback architecture, but the procedure is identical for any open-loop transfer function , even if some elements of the open-loop transfer function are in the feedback path. and thus the poles of the closed-loop system are values of such that . Let be the order of and be the order of (the order of the polynomial corresponds to the highest power of ). We will consider all positive values of . In the limit as , the poles of the closed-loop system are solutions of (poles of ). In the limit as , the poles of the closed-loop system are solutions of (zeros of ). No matter our choice of , the closed-loop system has poles, where is the number of poles of the open-loop transfer function . The root locus then has branches, each branch starts at a pole of and approaches a zero of . If has more poles than zeros (as is often the case), and we say that has zeros at infinity. In this case, the limit of as is zero. The number of zeros at infinity is , the number of open-loop poles minus the number of open-loop zeros, and is the number of branches of the root locus that go to "infinity" (asymptotes). Since the root locus consists of the locations of all possible closed-loop poles, the root locus helps us choose the value of the gain to achieve the type of performance we desire. If any of the selected poles are on the right-half complex plane, the closed-loop system will be unstable. The poles that are closest to the imaginary axis have the greatest influence on the closed-loop response, so even if a system has three or four poles, it may still behave similar to a second- or a first-order system, depending on the location(s) of the dominant pole(s). On the plot above, the two dotted lines at about a 45-degree angle indicate pole locations with = 0.7; in between these lines, the poles will have > 0.7 and outside of these lines < 0.7. The semicircle indicates pole locations with a natural frequency = 1.8; inside of the circle, < 1.8 and outside of the circle > 1.8. Going back to our problem, to make the overshoot less than 5%, the poles have to be in between the two angled dotted lines, and to make the rise time shorter than 1 second, the poles have to be outside of the dotted semicircle. So now we know what part of the root locus, which possible closed-loop pole locations, satify the given requirements. All the poles in this location are in the left-half plane, so the closed-loop system will be stable. Click on the plot the point where you want the closed-loop pole to be. You may want to select the points indicated in the plot below to satisfy the design criteria. Note that since the root locus may have more than one branch, when you select a pole, you also identify where other closed-loop poles are too, all for the same corresponding value of . Remember that these poles will affect the response too. From the plot above, we see that of the four poles selected (indicated by "+" signs), the two closest to the imaginary axis are in our desired region. Since these poles tend to dominate the response, we have some confidence that are desired requirements will be met for a proportional controller with this value of . The two arguments to the function feedback are the transfer function in the forward path and the transfer function in the feedback path of the open-loop system. In this case, our system is unity feedback. If you have a non-unity feedback situation, look at the help file for the MATLAB function feedback, which demonstrates how to find the closed-loop transfer function with a gain in the feedback path. As we expected, this response has an overshoot less than 5% and a rise time less than 1 second. Another way to complete what was done above is to use the interactive Control System Designer tool within MATLAB. Using the same model as above, we first define the plant, . The following window should appear. You can also launch the GUI by going to the APPS tab and clicking on the app icon under Control System Design and Analysis. 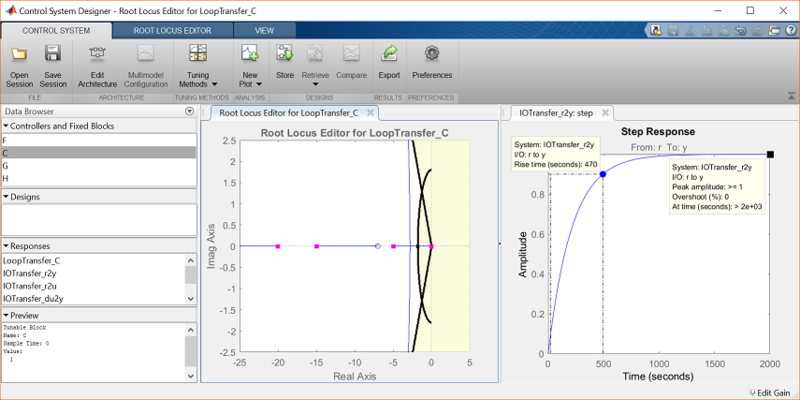 Here you can see the root locus plot, along with open-loop Bode plot, and the closed-loop step response plot for the given plant in unity feedback with a default controller of . 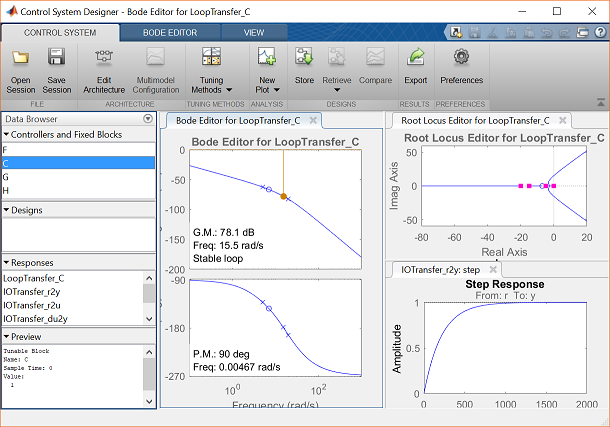 The next step is to add the design requirements to the Root Locus plot. This is done directly on the plot by right-clicking and selecting Design Requirements, New. Design requirements can be set for the Settling Time, the Percent Overshoot, the Damping Ratio, the Natural Frequency, or a Region Constraint. Here, we will set the design requirements for the damping ratio and the natural frequency as was done previously with the sgrid command. Recall that the boundary of our requirements call for = 0.7 and = 1.8. Set these within the design requirements. On the plot, any area which is still white is an acceptable region for the closed-loop poles. 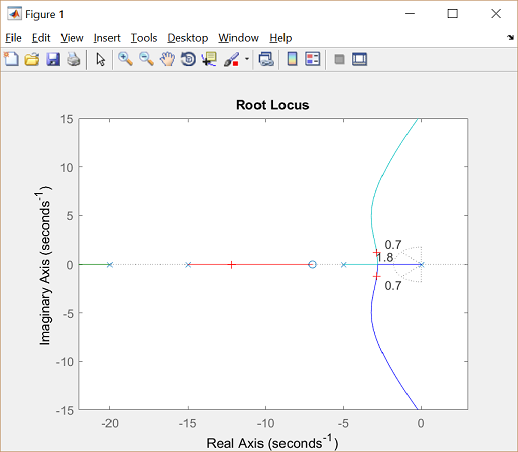 Zoom into the Root Locus by right-clicking on an axis and selecting Properties followed by the label Limits. Change the real-axis limits to -25 to 5 and the imaginary axis limits to -2.5 to 2.5. Also, we can see the current values of some key parameters in the response. On the Step response plot, right-click on the plot and go to Characteristics and select Peak Response. Repeat for the characteristic Rise Time. There should now be two large dots on the screen indicating the values of these parameters. Click each of these dots to bring up a box with information. 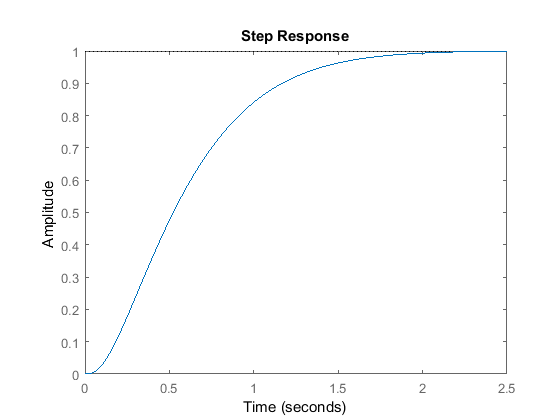 As the characteristics show on the Step response, the overshoot is acceptable, but the rise time is much too large. The pink boxes on the root locus show the corresponding closed-loop pole locations for the currently chosen control gain . To fix this, we need to choose a new value for the gain . Similar to how we employed the rlocfind command, the gain of the controller can be changed directly on the root locus plot. Click and drag the pink box closest to the imaginary axis (at the origin) to the acceptable region of our root locus plot as shown below. In the Preview box of the window, it can be seen that the loop gain has been changed to 360. Inspecting the closed-loop step response plot, both of our requirements are now met.